"Splayed" is not a term I like to use to describe a plant in my garden. It implies that either that plant has a poor habit of floppy its branches out from the center -or- that I am a lazy gardener who couldn't be bothered to provide any support for the plant. I call these Marquerite Daisies, and I'm pretty certain that's what they are. 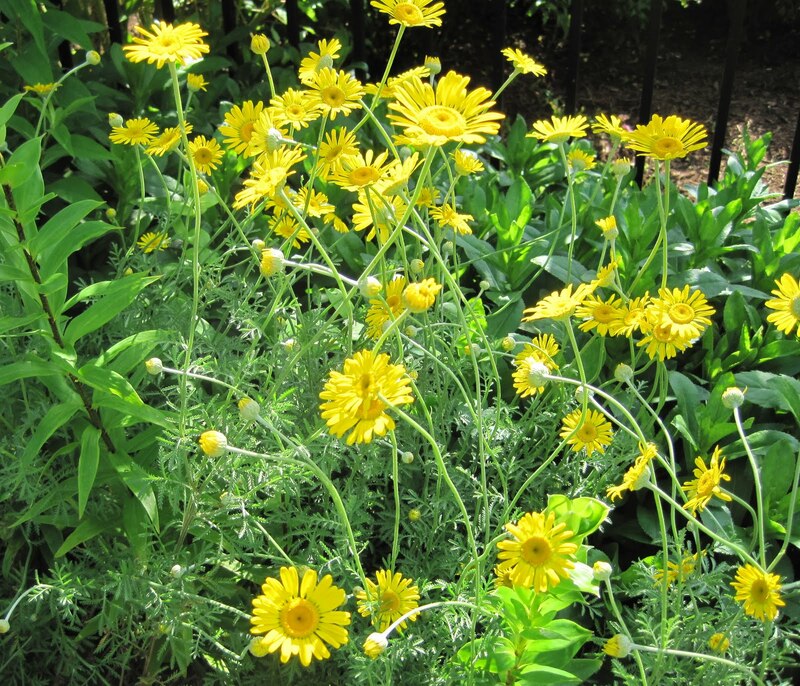 ; Anthemis something-or-other, maybe tinctoria. 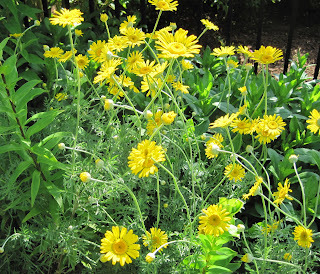 Or Anthemis splayius. 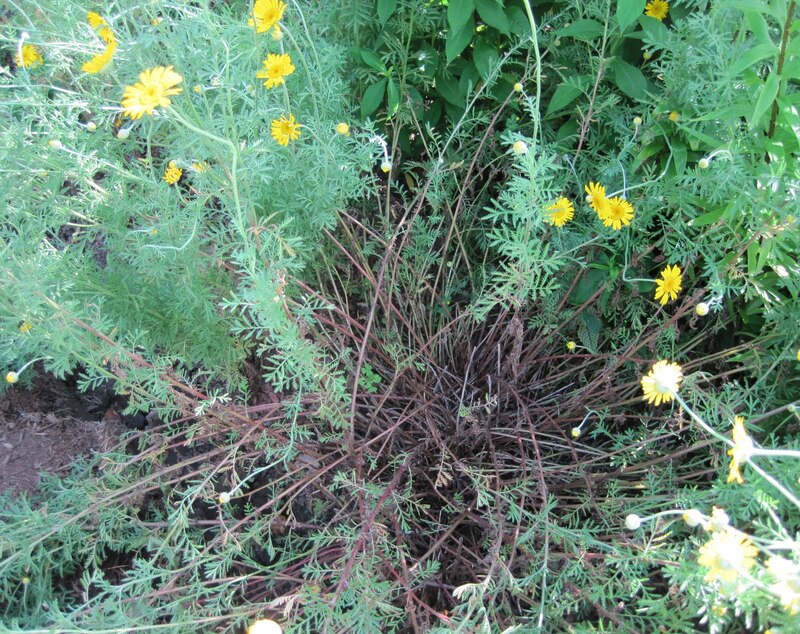 This particular plant has that very annoying habit of "splaying", just the second it starts to bloom. This evening, or sometimet soon, I'm going to dig these up, bag them up and take them to work to give away. I am sure someone will squeal with delight at the pretty bright yellow flowers and not be concerned a bit about the splaying. Of course, digging these up won't get rid of them entirely. They are prolific self-sowers, so I'll be pulling them as weeds for years to come, no doubt. And I'll warn anyone who takes one that they do that. I am a conscientious plant-giver! 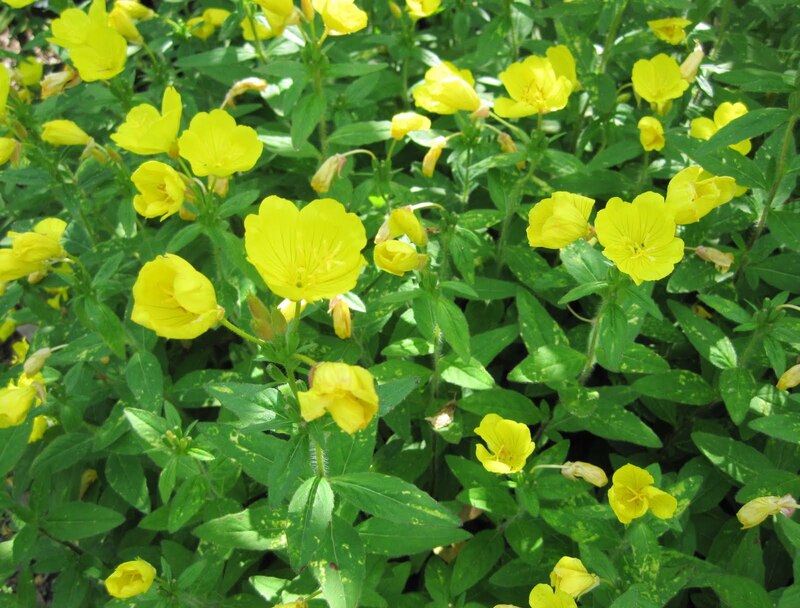 In the meantime, lest anyone be concerned that I won't have something yellow in my garden, right next to the Marquerite daisies is this Oenothera tetragona 'Sunspot', Variegated Evening Primrose. It has its own bad habits, but at least it doesn't splay. I like to call these Cottage Garden Plants. You can stake them, but they are definitely free spirits. They look great in a more relaxed garden area. How about sticking in pea sticks as the start to come up? I'm with you Carol. I really dislike staking things! I try to plant them near someone they can lean on, but the splayers, well, I dig them up and "donate" them too. Beautiful Sunspot though. I understand the problem with splayers that allow you to see right down to the roots and soil in the center. Right now I am more aggravated with a cranesbill. Instead of 'weaving at the edge of the garden bed, it grows in a lump. I visited a garden on Sunday that had a beautiful graceful cranesbill weaving all over the place. The owner said it was an old variety, unavailable now. Grrrr. But surely there are other available cranesbills that are more graceful. Help! Most of my pretties do that, too but I just plant another "splayer" too close so that they lean into each other. The picture of lazy! I have several splayers in my garden. I can't seem to bring myself to get rid of them. If I could find a place with more sun they wouldn't splay quite as much. I must be one of those lazy gardeners becasue I bet they splay the rest of this growing season too. I had to remove a few tall daisies today because they were splaying. This splaying of daisies that were once upright is no longer a pretty display in the garden... I too" may just have to remove them altogether.